For someone who spends an awful lot of time finding ways to squirrel away savings into the pockets of his absurdly rich billionaire buddies, President Donald Trump seems more than comfortable chipping away at the safety nets in place for those less fortunate than himself. 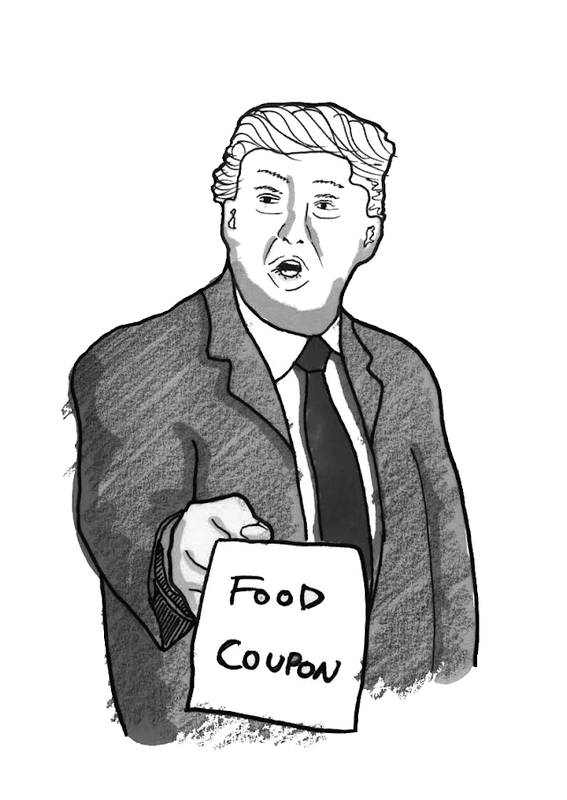 His latest target: the Supplemental Nutrition Assistance Program (SNAP), colloquially known as food stamps. SNAP provides families whose income falls beyond the poverty line with the means to purchase additional food to supplement what they can afford on their budget. They can buy various food products at a number of retailers across the country with the money put on an electronic benefit transfer card each month. More than 42.2 million Americans rely on the program, many of whom are children, elderly, disabled, or homeless. And Trump plans to cut funding for the program by nearly 30 percent — more than $213 billion — over the next decade. To do this, he wants to have the federal government send packages of food to recipients, a delivery that would make up about half of their benefits. The goal is that the food delivered would be cheaper than that purchased individually through retailers — thus saving the government money — as well as more nutritious. But these magical, cheap packages are nowhere near as perfect as they may seem to Trump. For one thing, they are projected to contain “shelf-stable milk, ready to eat cereals, pasta, peanut butter, beans and canned fruit and vegetables.” These choices limit options for picky eaters. They are full of items that those who are lactose intolerant or allergic to nuts or other ingredients, who have celiac’s disease, or who suffer from other dietary restrictions cannot have. And they do not include kosher or halal options or alternatives to more sugary foods like the fruits for diabetics. Taking half of these people’s benefits away and giving them food they cannot eat in return will have catastrophic results on their monthly budgets — and their health. That doesn’t even account for the homeless on SNAP, who have no place to store a box of food meant to last an entire month and no place to cook the ingredients included as part of the package. It’s already difficult for the homeless to survive on SNAP since the program doesn’t usually cover pre-made meals from stores or fast-food restaurants. Without a pantry and a fridge to store the contents of the package until it can be eaten, recipients will struggle to keep and consume their package over the course of the month. Furthermore, while the focus on healthy food may seem like a good way to target obesity and improve the overall health of those on benefits, healthier foods actually have far fewer calories, and thus give consumers far less energy, than high-calorie “junk” food, according to The New York Times. According to a study by University of Washington researchers, enough food to satisfy a 2,000-calorie diet can be obtained for just $3.52 a day — as long as the foods are energy-dense, high-calorie items like baked goods and snacks. But when you buy enough foods with lower calories to meet a 2,000 calorie diet, the price increases to around $36.32 a day. The chances that these government-picked packages, which are meant to contain healthier food rather than chips and cookies and still be cheap enough to drastically cut the price of the program, will contain enough calories for people to make it through the day is extremely unlikely. The packages will also take business away from local grocery stores and farms who currently accept food stamps in communities. Many small businesses accept food stamps, particularly in rural areas, as a significant part of their income. But with the money SNAP recipients receive cut in half each month, these stores would see a decrease in business. Even the projected cheaper price of this initiative is probably too good to be true. Admittedly, it is likely that the government can obtain the food for a fraction of the price retailers sell it for. An existing program that sends boxed food to low-income seniors — the program that Trump’s plan is modeled from — costs the government around $22 for a box that might cost $40 to $50 if purchased elsewhere. But the program for seniors operates on a small, local scale — in order to generalize it to everyone on SNAP, other costs would begin to appear. For example, these cheaper prices do not account for the cost of packaging and delivering the boxes to recipients. The existing program for seniors relies on volunteers to pack the boxes and distribute them from pickup centers and low-income apartment buildings — but local agencies probably don’t have the resources to deliver millions of boxes to those receiving benefits on their own. On the large-scale level of SNAP, paid employees would likely be needed to oversee distribution. Additional complications arise from this model, too. How are homebound seniors, those unable to carry a heavy box by themselves, or those in rural areas without transportation meant to pick up their packages each month? What about people who work during the hours of pickup and can’t take off? If people are hired to deliver packages to their homes, these people will have to be paid as well. And if picking up the packages is simply deemed a personal problem to be dealt with on an individual basis, many recipients will be unable to do so and will go hungry as a result. People who are more well off than those on SNAP have already shown distaste for the idea of receiving boxed meals. Blue Apron, a high-end meal kit delivery service that many are comparing to Trump’s proposal, had a notoriously low stock in 2017 and has struggled to hold onto customers. To assume that poorer people are better suited to the lack of options and the specific ingredients of a pre-packaged set of meals — to take away the agency of people in this way, even as those on SNAP are repeatedly told to become more independent and take care of themselves — is full of misplaced distrust and even outright contempt for the poor. Trump’s spontaneous and unexpected proposal shows a typical lack of thought for real consequences and consideration of the realities people face, like so many of his ideas so far into his presidency. His military parade, which would cost tens of millions of dollars, is another recent idea that is equally as out-of-touch as this one. But perhaps these ideas are related in another way as well. About seven percent of all veterans (around 1.5 million) and between one and two percent of all active-duty military members (between 2,000 and 22,000 members) used food stamps in 2012. Maybe Trump should commit to helping them, along with other SNAP recipients, rather than staging his grand display of power. The number of people receiving SNAP benefits has actually decreased in recent years. After spiking in 2013 after the 2008 Great Recession, the number of recipients has gone down more than 5 million. Hopefully, it will continue of fall as more people find full-time jobs and get back on their feet. But if that’s not enough — if we still want to do more to decrease the number of federal dollars spent on the poor, and to help improve the quality of life for lower-income Americans — there are other ways, ways that have already produced positive results, that we can do so. We can make sure that schools provide free meals to children to take some of the burden off poorer parents — and address the shame surrounding such programs, so children feel comfortable taking advantage of the option. We can create community gardens in food deserts, areas where there are no grocery stores with healthy, affordable foods so that people in those areas have more options when it comes to meals. We can also look into “housing first” options, which seek to decrease the amount spent on SNAP benefits, incarceration, medical treatment, and other expenses by addressing homelessness in communities. In many cases, it’s cheaper — and obviously far more humane — to provide homeless men and women with permanent housing rather than leaving home on the streets. A Florida study from 2014 showed a 68 percent reduction in cost between homeless people and those provided housing. Another study focusing on a program in Charlotte, North Carolina showed similar results: a 78 percent reduction in emergency room visits, a 79 percent reduction in hospital stays, 84 percent fewer days in jail, and a 78 percent drop in arrests. Off the streets, participants in housing first programs can regain their dignity, focus on any mental health issues, and concentrate on finding and keeping jobs more easily thanks to increased stability. Plus, with pantries, fridges, and stoves, people will be able to store excess food, cook ingredients, and even explore healthier options on their own. They will no longer be in a position that allows Donald Trump and his abusive, out-of-touch government to do it for them.